The camera's viewfinder has three lines filled with the <<<<<<<<< symbol. Try to align these lines with the actual document's MRZ code. 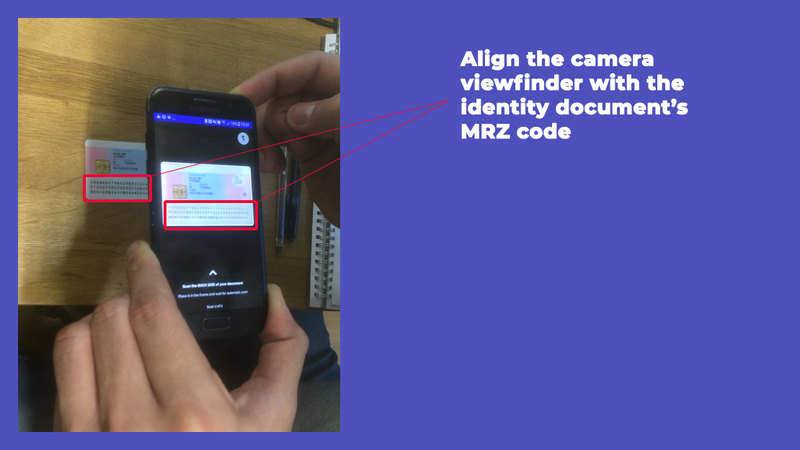 Ideally place the identity document on a flat surface like a desk, then with your other hand move the phone until the MRZ code 'sits' on top of the three lines in the viewfinder. The MRZ is a two or three lines code. It is usually at the bottom of the identity page at the beginning of a passport or the back side of an identity document. 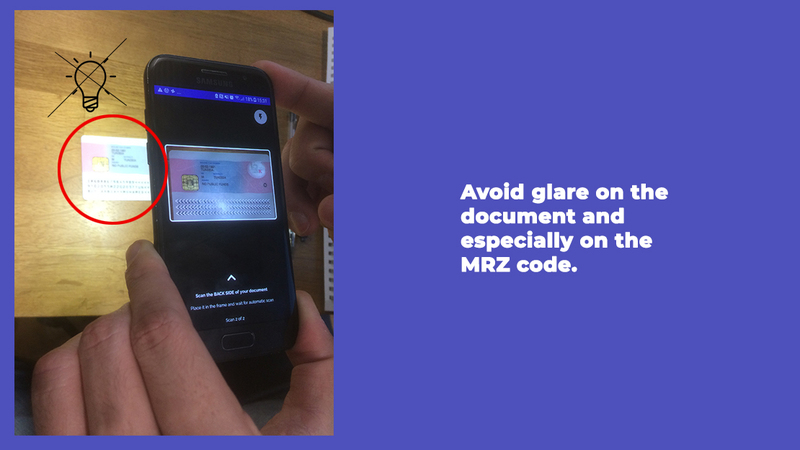 If there is glare on the MRZ document, the app will not be able to take the picture. Move the document to a position where there isn't bright direct light falling on the MRZ code. If necessary, cover the document with your body. Place the identity document on a flat surface. Then start from the top of the document and move the phone downwards until the chip reading starts - you will see the progress indicator move. Most passports have the chip in the middle of the document but if you move the phone in a downward sweeping manner you will easily find the chip. Usually scanning the front side works fine. If not, follow the same same technique on the back of the document. Avoid placing the document on a metal surface as this may interfere with the reading process.